Well, as you all are, I am also embarrassed (I am not sure whether this is the right word to use) at the interview given by Shri. Rahul Gandhi to Arnab Goswami of Times Now, yesterday, in the programme titled ‘Frankly Speaking’. Interview caught the attention of many for Rahul Gandhi is the ‘unproclaimed’ PM candidate of the Congress Party. Had someone else from the party done a show like this, even worse, nobody would ever care to care; but this is RG. Hence, people would listen to and would criticize if he goes wrong on things. As it goes without saying, Rahul could have given better answers, and mostly cut down his repetitions and irrelevant answers. This post is, in noway, to showcase how good or bad Rahul Gandhi is. But this is just a retro, on how this interview could be routed, in the views of a common man like me. No harm intended for anyone. Take this as a review of the show. Note: Giving answers to questions post-interview is no a big deal. Take this as a retro. Just in an academic perspective. Arnab: It’s your first time. Isn’t it? Why has it taken so long? RG: I have always kept talking to the media, through press conferences. A one to one interview was not given for many reasons. But whenever I found it necessary to talk to people, I did it. 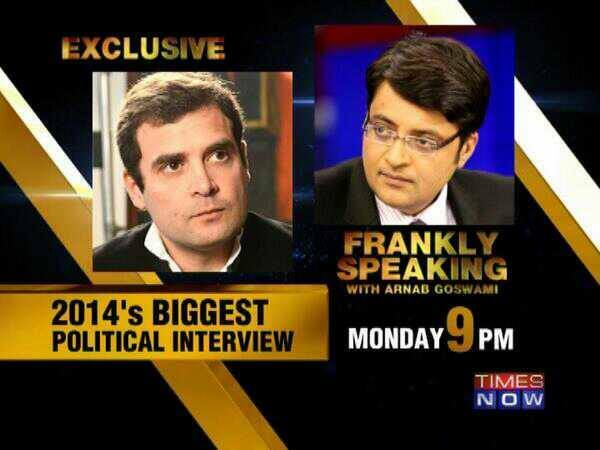 Arnab: Now that this is your first detailed & long interview in 10 years, we have a lot of ground to cover. I have one request to you right at the start of the interview, let’s be as specific as possible on the subjects we deal with today. Do I have your Agreement on that? RG: Definitely, yes. Let the questions be specific too. Arnab: Rahul Gandhi the first point is this; you have just avoided this whole question about whether you are open to PM’s post. It seems to me Rahul that you are avoiding a difficult contest. RG: First of all, Congress has no history where it nominated its Prime Ministerial candidate. Ever. There have been people responsible to lead the campaigns for the Congress-led alliance, but he or she need not be nominated as the PM. As I believe, in a democratic system, it is fair and good to select a PM, and not elect him, from amongst the MPs, by the MPs. We do not follow the Americal System of Presidential election. We have a separate system in working. Arnab: Are you avoiding a direct face-off with Narendra Modi? 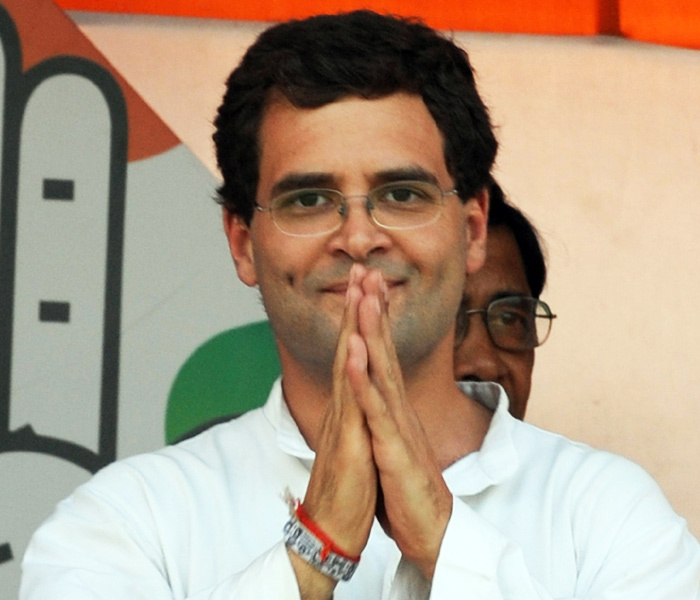 Is there a fear of loss, RG, because this election is not looking good for the Congress party from overall estimates? RG: Definitely No. I must admit that there have been some set downs for the UPAs because of acts by some of the ministers of our alliance parties. But above all those, the most people-friendly projects that free India has seen are brought in by the UPA-I and UPA-II governments. I believe, if the party can pervade the benefits of these projects and missions amongst the common man, victory will be an easy go. And Shri. Narendra Modi is not at all an opponent for the UPA. After all, we are not competing against a person. Arnab: Narendra Modi is challenging you on a daily basis? RG: I do not believe he has to challenge the person me as such, and I don’t believe he should do so. A democracy is a fight between two or more ideologies, not two or more people. When it is concentrated between two people, that becomes not democracy, but centralization of power. Centralization of power is in no way good for democracy. In that sense, if at all Shri. Modi challenges the person ME on a daily basis or an hourly basis, I would prefer not to reply to those challenges. 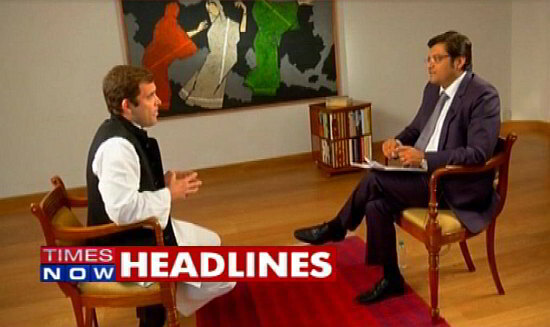 Arnab: Narendra Modi calls you a Shehzada, now let’s be very specific RG. Narendra Modi calls you a Shehzada, a) what is your view of Narendra Modi b) are you afraid of losing to Narendra Modi, Rahul please answer my question as specifically as you can? RG: As I mentioned earlier, there is no point of talking about a person. So my personal view about Mr. Modi is not important here. Still, as you asked, I am a perfect oppose of the policies of the Party that is represented by Mr. Modi. India is a secular country, and no ideology which is not based on this very virtue can be treated as viable or good. I am being very specific, neither do I nor does the Congress Party have any kind of ‘fear’ – whatever you call – regarding the GE2014. That’s a sure shot win for UPA. Arnab: My question to you is, what is the Congress Vice President’s view of the BJP Prime Ministerial candidate? RG: I think I have already answered that question. Further, I do not believe a person who is with a stature of having involved in the 2002 incidents in Gujarat personally qualifies to run for the august post of the country. Arnab: How do you accuse Mr. Narendra Modi of it? Courts have given clean chits to him. RG: He was the Chief Minister when it took place. Investigations are going on, and the present verdict is not the final one. From the sources I have, I believe that as the CM of the state, he had enough of intelligence reports prior to the 2002 incidents, but he chose to be inactive in stopping the mishappenings. Being inactive is equally criminal. In a way, he was supporting the riots against the minorities. All these are the reflections of the ideologies his party follows. Arnab: I am sure you don’t, my question is do you acknowledge the role of Congress men in the 1984 riots? RG: Yes, I acknowledge. As an extension, let me add that Congress will never tolerate corruption, and criminal behaviours. As you can see, some congressmen were involved in this and the law has taken its turn in the issue. However, you cannot compare 2002 with 1984, where in the latter the Government took active measures to put a stop to the riots, but in the former, culprits are even behind the shade. Arnab: Mr. Gandhi let’s move on to the RTI. Which is the single biggest legislation to combat corruption. Which you said in your speech at the AICC that was something that you were speaking about. Now, I find it ironical that a party which has 90.38% of its funds from cash between 2008 and 2012. 89.11% of its money comes from unaccounted sources, unnamed sourced. Why would you not say charity begins at home? RG: Yes, I personally believe that parties should come under RTI. We have discussed this within our party. But to make it a law, we need support from other parties in the parliament too. We are working on it. RG: They have not rejected it. There has been a revision of that decision and it is not complete yet. I shall comment once it is done completely. Arnab: Leader of the party is Lalu Prasad, hence you are making an alliance with an individual? RG: The UPA has not decided on its alliances in GE2014. However, whatever alliances we will have, they will be with ideologies and not with individuals. Congress will look for friends with similar ideologies, who are secular, supportive to development and who believes in good for common man. Arnab: Did UPA 2 let you down on prices? RG: We cannot blame the government for the price hike. It is a global scenario. As you know, there have been issues with most of the world countries, and some of them even saw their worst in the history. The effects of this have also been visible in our country too. Nevertheless, the common man is not interested in knowing all these; he doesn’t want to know what happens in Greece, or what is being done at SUMMIT or so. He wants to know how well he can lead his life with basic amenities. For that UPA government has taken many steps, including ensuring that the subsidies reach them properly, MGNREA, etc. However, we are still working on reducing the effects of price hike. Arnab: What is your view on Arvind Kejriwal? RG: He is just another leader of a political party in India. However, I still believe that their success – I reiterate, their success, not his success – is an eye-opener to many, including Congress Party. Arnab: You will win the election? 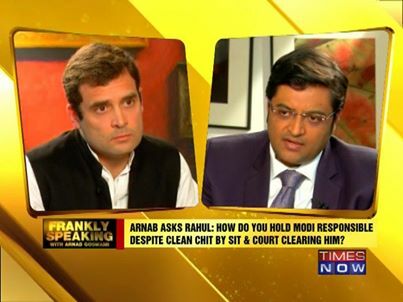 RG: Yes, but WE, not I.
Arnab: And if you don’t win do you take full responsibility for it? RG: As the person who leads the campaign, and as the Vice-President of Congress Party, Yes. Arnab: If the AAP goes against Sheila Dikshit in the CWG scam, will you continue to support them? RG: With no doubt, yes! If it is not AAP, but the law that goes against. Arnab: Are you open to a public debate with Modi and such other leaders on national issues, before the elections? RG: Absolutely. If it is a matter concerning national interest, and not mud-throwing. Let’s be specific and open. Let’s talk about empowering the common man, empowering the women, empowering the youth, changing the current system… If it is a discussion on those grounds, I am game.